It's hard to believe that "the best" could get better, but Chariot Carriers has converted its entire line of CTS child carriers to its patent pending VersaWing 2.0 technology. The VersaWing 2.0 allows for enhanced functionality and even quicker and easier conversion of Chariot's CTS carriers between five different performance modes: jogging, cycling, hiking, strolling and skiing. As well the highly innovative VersaWing 2.0's include a number of new "Chariot Firsts" features: integrated pivoting front wheel brake, side mud guards, push button release stroller casters, and Click'n'Store attachments. But the changes don't stop there. The fully-functional but mid-priced Cheetah receives a sleeker body, new colors, deluxe padded harness and, of course, the VersaWing 2.0. And the original Chariot child carrier, the Cabriolet, also gets a new color scheme, with a new sleeker body design, new side air vents for better air flow, and the VersaWing 2.0. The upgrades continue with new colors for Chariot's unique SideCarrier (the world's coolest way to ride a bike with a child); a new body design and deluxe shoulder harness for Chariot's economical Caddie. While all of these improvements may register high on the innovation scale, keep in mind that Chariot carriers are both safe and tough. In fact, all Chariot products not only have to comply with applicable safety standards, but also Chariot's own significantly stricter testing. And tough? Chariot carriers have been run across the Australian outback, the length of the United Kingdom, along the Great Wall of China, and Jean Beliveau, a world adventurer, is still using a Chariot Cheetah 1 while in the 6th year of his 12-year goal to walk around the world. With all of Chariot's innovations, upgrades, and adventures demand is up which means a larger facility. Chariot has added 11,000 square feet of production and warehouse space to its already existing 33,000 square feet. Which should translate into more great Chariot carriers being created and shipped to join in family adventures from local streets to global holidays. 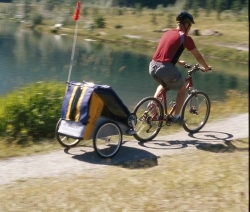 Check out the complete line of Chariot Carriers at www.chariotcarriers.com, and stop by Chariot's booth #375 at the 2006 Interbike Tradeshow.